Fortunately, more and more people are taking steps toward making their homes energy efficient and living their lives in a way that’s responsible toward the environment. Whether your goal to live a more eco-responsible lifestyle is only starting to take shape or you’ve been striving to live this way for a while, there are always improvements to be made. The kitchen is the heart (or hearth) of the home, so our approach to how its functions holds not just practical, but symbolic value. 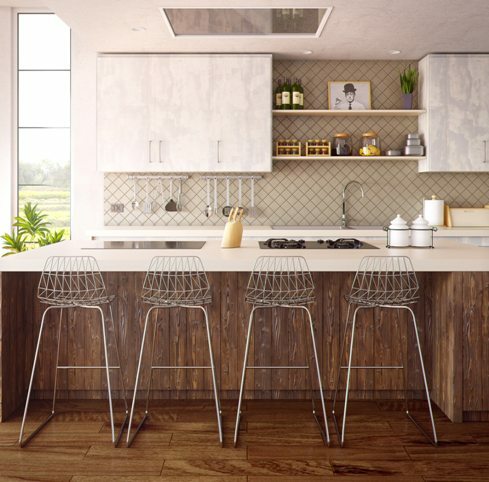 In light of that, let’s have a look at some simple changes you can make in your own kitchen to make it more eco-friendly. So much water gets wasted in the kitchen sink, and leaking faucets are a major contributor. It might look as if the drips are miniscule, but they accumulate. Always check if your faucet is leaking and fix the leak – you’ll be likely to find a decrease in your annual water bill as well. If it’s time for a new one, invest in a WaterSense-labeled faucet that is low-flow and thus doesn’t use excessive amounts of water. Use wooden cutting boards instead of plastic boards and mats. Wood types such as bamboo also naturally reduce the growth of microbes. Use a reusable shopping tote for groceries – one that is made from cotton, hemp, or any other natural material. Wash it frequently and hang it somewhere visible so you don’t forget it on your way to the store. Substitute plastic food containers with eco-friendly containers made from glass, silicon, or metal. Use reusable beeswax wraps instead of plastic food wraps as they do the job just as well, and can be washed and reused. If you buy some groceries in plastic containers, wash the container once it’s emptied and reuse it for food storage. The best thing to do is to invite plenty of natural light into your kitchen, so that you can see properly without using artificial lighting an you get that bright, open, Pinterest-worthy space. In that case, you’ll need adequate window furnishings to control the amount of sunlight that comes in on hot days, so you don’t have to use air conditioning. Otherwise, invest in energy-efficient lightbulbs for your task lighting – LED lights use less energy than any other form of lighting, and this will show on your electric bill as well. Install dimmer switches so that you can use them on occasions when you don’t need full-on lighting. You might be using your garbage disposal frequently as they really are convenient, but they’re not quite eco-friendly. Make your own compost bin (you’ll see that it’s not difficult at all!) and make a point of adding to it all the vegetable scraps, leftovers, and organic matter from your food preparation. You’ll save on water and energy and you can use the compost matter to nurture your plants. Speaking of plants, here’s an extra tip: grow an herb garden inside your kitchen. It will add a touch of green to the space and also purify the air, plus you’ll be incorporating a lot of healthy herbs into your meals. And the smell in your kitchen will be better than any artificial air freshener could ever hope to be. Invite these little changes into your kitchen and enjoy the benefits. As time passes, you’ll be implementing more and more eco-friendly tricks, and you’ll find it’s not that difficult at all. A green kitchen is the start of a green home.